The Rainforest Cafe is part of a national chain of restaurants. There's a huge saltwater fish tank that's part of the decor. Waterfalls, lush plantings and sound effects add to the atmosphere. Periodically there's a "thunderstorm" and the animatronic animals spring to life. The Magic Mushroom bar is surrounded by whimsical animal shaped barstools. Specialty drinks are featured and there's a bar menu. Adjacent to the restaurant is a large gift shop featuring Rainforest themed merchandise. You don't need park admission as there's an entrance outside of the Animal Kingdom. If you are in the park, you can enter from there as well but you will be leaving the park and will need to re-enter. There are currently 21 reviews for Rainforest Cafe at Animal Kingdom. 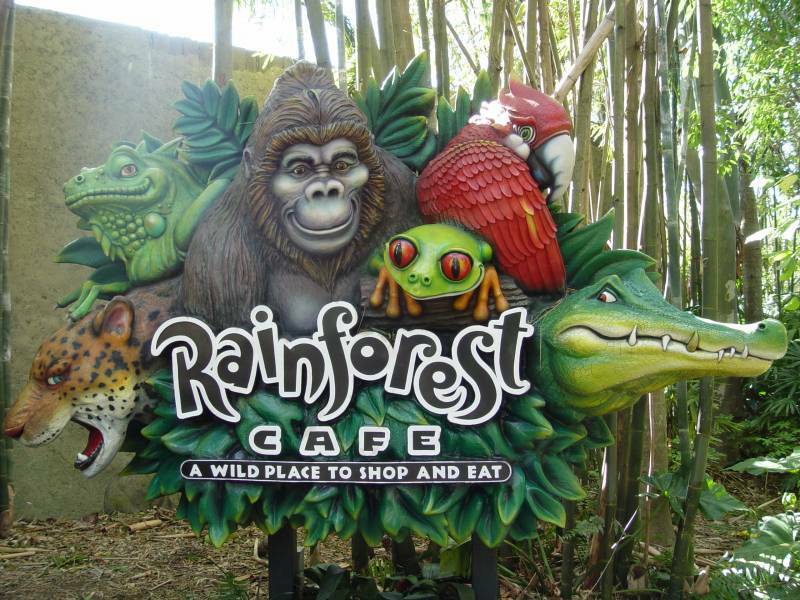 Read Full Rainforest Cafe at Animal Kingdom Reviews! You can also search for Rainforest Cafe at Animal Kingdom specific threads! All menu items/prices are subject to change. Last updated 02/18/2018.